Augmented and Virtual reality holds enormous potential outside of entertainment, with AR/VR poised to change the way we shop, experience, communicate and even conduct business. The benefits of these technologies in education are pretty clear; more student engagement, faster learning and better quality of education. Q3 provided a complete Virtual and Augmented Reality solution with all the gamification features. The Client is an Indian multinational company that offers learning management and training delivery solutions to corporations, institutions and individuals. It has three main lines of business worldwide: Corporate Learning Group (CLG), Skills and Careers Group (SNC), and School Learning Group (SLG). Educators know that learning process should be all about creativity and interaction. AR and VR technology has an ability to render objects that are hard to imagine and turn them into 3D models, thus making it easier to grasp abstract and difficult content. This is especially good for visual learners and practically anyone to translate theoretical material into a real concept. For students belonging to an age group of 7-12, an application which was capable of visualizing the Solar System in 3D was required. The objective was to create engaging content for students to aid learning with much more creativity and expand the scope of using smartphones for education. Two variants of the application were required, one is AR and the other in VR. The idea behind two variants was to allow the students to enjoy the 3D experience at home even without a VR headset. Q3 provided a complete Virtual and Augmented Reality solution with all the gamification features to meet the requirements of the client. The VR app was developed on Unity Platform with the Google Cardboard Virtual Tool Kit and the AR app using the Vuforia SDK. AR App Launch Image: The student has to point the device camera at the target image of a solar system on his/her textbook to launch the application. 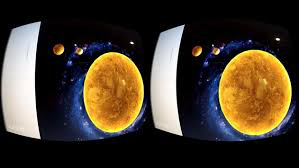 SkyBox Galaxy environment: The application opens up in a skybox environment, which gives the student a feel of being present in the solar system. Rotation and Revolution of Planets: The planets rotate and simultaneously revolve around the sun with scaled speed to give a realistic effect. On Tap Planet Information: The student can tap on any planet to get information about its size, position, and distance from Sun in written as well as audio format. Quiz: The student can take a quiz to test knowledge by tapping the “Take Quiz” section. VR App Launch: The VR app launches in a VR Headset box. Using the white reticle pointer, the student can gaze on any planet to extract planet information and to take the quiz.